Your gifts will sparkle with this 1/8" Organza Mono Ribbon in Silver. The mono-style ribbon is made of shimmering sheer fabric and has a thin satin edge. Tie bows on gifts, candy boxes, gusset bags, gift baskets, flowers, and more. 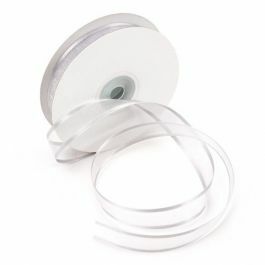 Our RIB8SIL 1/8" Silver Mono Ribbon is perfect for celebrating anniversaries, black tie events, parties, and weddings. The shimmering texture is made of 100% nylon woven sheer fabric and comes in 50 yards per spool. This fabric offer a see-through sheer quality, adding a classy elegant touch to gift packaging, favor bags, memory books, invitations, and decorations. Make any occasion special with this silver Organza ribbon. 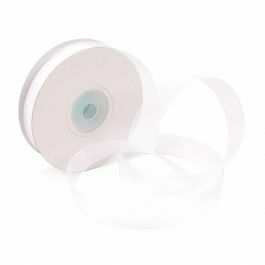 The primary use of RIB8SIL Organza ribbon is to decorate gifts or tie up favor bags.